The Disciples of Christ, First Christian Church, was founded in the early 1800's in the United States. The founders of the Christian Church, seeking to move past squables of denominational disagreements, envisioned a single church based upon the New Testament with a belief focused on Jesus, rejoicing in God and accepting a mission to witness for Him. The church grew rapidly across the United States, with nearly 4000 congregations in existance. Like most other Christians, the members of the Disciples church affirm that Jesus Christ is the son of the Living God and offers saving grace to everyone, and that all persons are God's children. 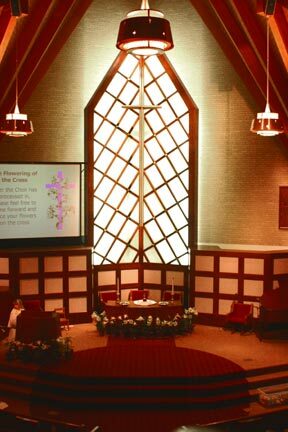 The Disciples church practices open communion, usually weekly, open to all believers in Jesus. The church is open to a diversity of opinion, allowing the individual to found their beliefs based upon the scripture and be guided by the Holy Spirit through study and prayer. Members of the Christian church believe in Baptism by immersion, wherein the old self is put aside and a new life in Jesus is made. The Disciples of Christ stress the importance of the unity of the Christian faith as a whole, regardless of denomination, remembering that all are brothers in Christ - the one necessary faith being a belief in Him as Lord and Savior. Website established 27 February, 2006. Full revision June 18, 2012.